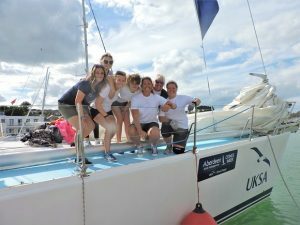 Dee Caffari MBE officially launched the charity’s Women into Sailing careers initiative on ‘Charity Monday’ of Aberdeen Asset Management Cowes Week. To mark the launch of the programme UKSA graduate Dee spent the day sailing with an all-women crew from UKSA and key guests during the world famous regatta. The Women into Sailing careers programme will promote and help young women to work professionally within the marine sector. 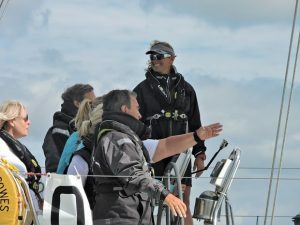 The initiative will include bursaries to support the funding of professional sailing courses for women; campaigns to encourage participation in sailing by women plus sailing taster sessions for groups of girls with the moniker: This girl can sail. Dee, a former P.E teacher, started her training at UKSA’s centre in Cowes with a Watersports Instructor Training (WIT) course. This led her on to the Pro-Crew and Skipper Training (PCST) course (now equivalent to the Professional Yachtmaster qualification). Dee became the first woman to sail solo around the world the wrong way, non-stop in 2006. Following her circumnavigation in 2006, her sixth-place finish in the Vendée Globe in 2009 made her the first woman to sail solo and non-stop in both directions around the Globe. As a leading maritime training centre UKSA recognise there are many jobs opportunities out there from Watersports Instructors right through to Officers of the Watch. In addition to encouraging more women into a marine-based career UKSA will also offer a 12-week sailing club at their Cowes base, exclusively for young females aged between 14 and 18. UKSA’s fundraising appeal this Cowes Week will allow them to run two residential programmes for disadvantaged young people in 2016 and start the works needed to invest in their Centre, enabling them to increase the number of young people they support. You can support them today by bidding in their online auction http://www.uksa-auction.com .